This is it y’all, this is the cookie recipe. The one I’ve been working on for two years. My beloved dough is all dressed up for spring here with tangy berry and lemon flavors and I couldn’t be happier about how these turned out. This recipe makes a perfect cut out cookie that is tender yet keeps any shape you cut it into. Some bakers simply use shortbread for their cut out cookies since, without any eggs or leavener, shortbread always keeps its shape. But this is no crisp, crumbly shortbread—this is a soft cookie with a tender crumb. And it’s all thanks to a couple of key techniques and ingredients, the most important of which is cream cheese. Replacing some of the butter in a basic cut-out cookie recipe with cream cheese allows the cookies to stay soft and moist while minimizing spread. Plus the slight acidity of cream cheese acts as an extra tenderizer, ensuring these cookies have a smooth, soft mouthfeel and none of the dry flouriness that ordinary rolled doughs have. Just make sure you’re using real, full-fat cream cheese blocks and not the spreadable kind that comes in tubs. A fellow pastry chef told me that in France his colleagues call cream cheese, a newish product to them there, “Philadelphia” and praise its wonders—in Spain and Mexico it’s called queso filadelfia. It’s really a unique cheese when you think about it—it’s not exactly like other soft cheeses, and the particular fillers it uses (gelatin, xanthan gum, guar or carob gums) give it a special consistency that makes it both creamy/spreadable and able to keep its shape. I developed this recipe because I really wanted a cut-out cookie that tasted as good as it looked. I’ve tasted plenty of fancy decorated cookies in my life and hooo boy, some people just do not care how their cookies taste, I can tell you that for sure. Especially in our image-soaked Instagram-era of baking where carefully edited photos are often valued over, you know, flavor, I wanted to make sure my cookies could walk the walk. This dough is truly foolproof. It is very easy to work with, versatile, and tastes even better than all-butter cookie dough in my opinion. Follow a couple of my temperature techniques below and you can accomplish anything—ANYthing—with this dough. Since I had lemons and blood oranges laying around, I decided to make a curd of each—honestly they are both great, but the lemon curd is really a knockout. 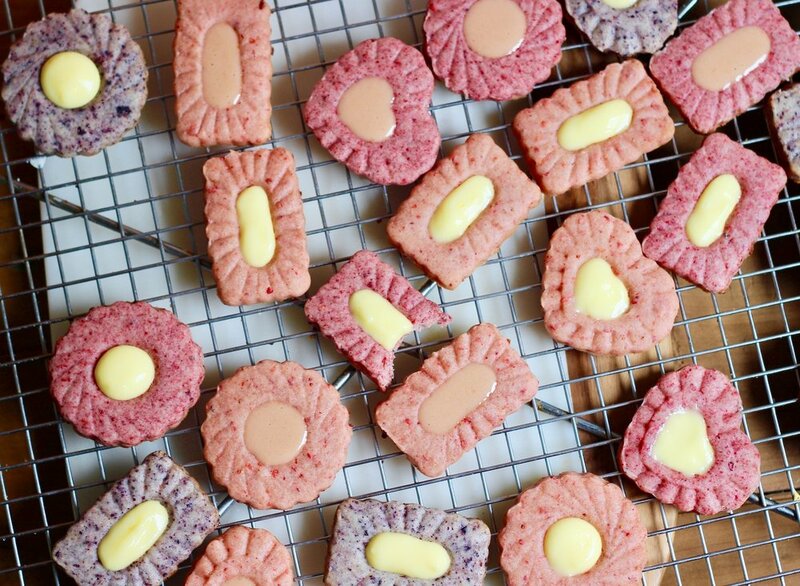 Here I’ve simply added fruit powder to the dough for a pop of color and intense flavor—pairing the cookies with tart lemon and orange curd makes them an incredibly fun and flavorful cookie. To make a plain version of these cookies, just omit the fruit powder. Or try an added 1/3 c. of cocoa powder for the best chocolate cookies you’ve ever tasted. Side note: never listen to a recipe that tells you to “substitute” some flour for cocoa powder to make something chocolate. That’s insane. 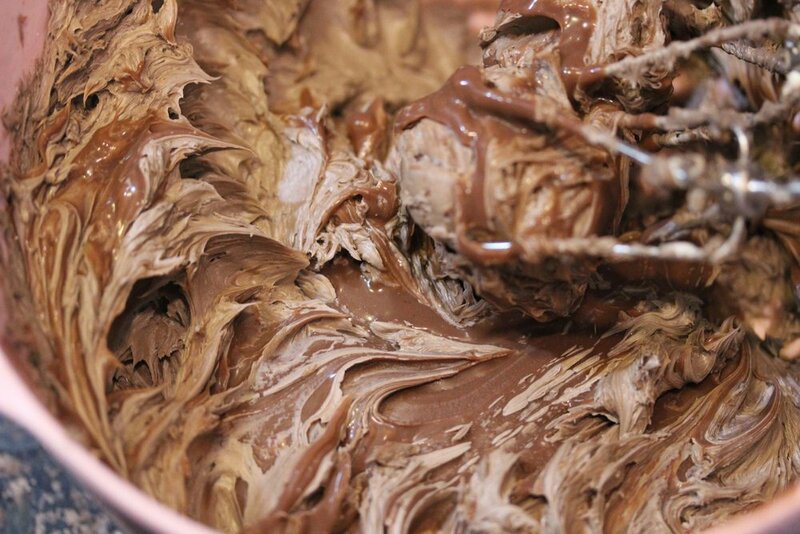 Cocoa powder is made of dried cocoa solids…it is not a grain, and it behaves very differently from flour in a recipe. Just because both are powdery and dry doesn’t mean you can substitute one for the other. This dough recipe is receptive enough to allow up to 1/3 c. of any low-moisture addition—cocoa, fruit powder, spices, herbs, chopped nuts, heck, go crazy. Freeze dried berries are easy to find in the grocery store now (Trader Joe’s consistently has great freeze dried fruit options), although certainly you can find them online too in bulk. I used raspberries, strawberries and blueberries here, and I’ve also used peaches, apples, and mangos to great effect with regards to flavor (not so much with color). 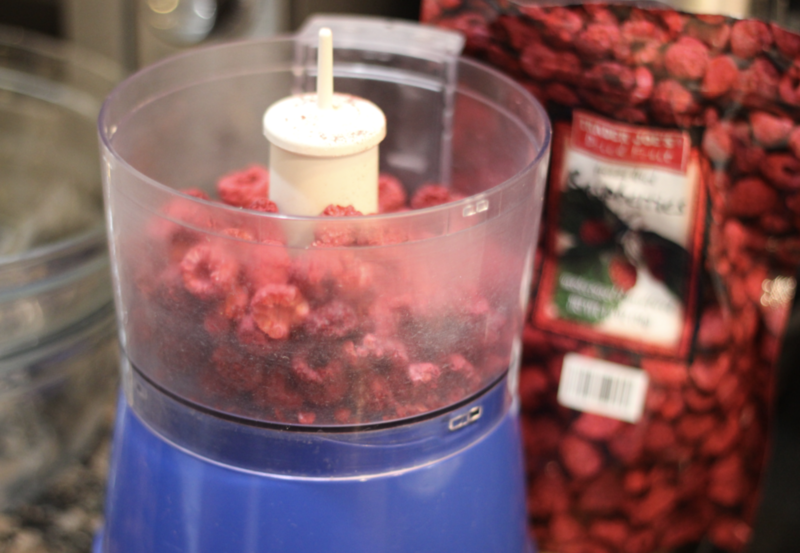 My mini food processor is perfect for the job of pulverizing the freeze dried berries into powder. If you don’t have a food processor, just beat/roll the berries in a ziplock bag with your rolling pin until finely crushed. DON’T FORGET to look for the little inedible silica packet that often comes in freeze dried fruit packages and remove it before whizzing everything together! I have made this idiotic mistake a few times when I’m in a hurry and have had to throw out entire batches of fruit powder once I saw the mangled silica packet buried in the powder. The only common errors that can happen with this dough are (1) not mixing the cream cheese and the butter well enough and (2) not pulling the cookies from the oven at the right time (more on that later). Since the two ingredients have different consistencies and usually different temperatures, you can sometimes get lumps of cream cheese in your dough if you don’t scrape the bowl well or mix long enough. Here I’ve stopped mixing too early so you can see the lumps. 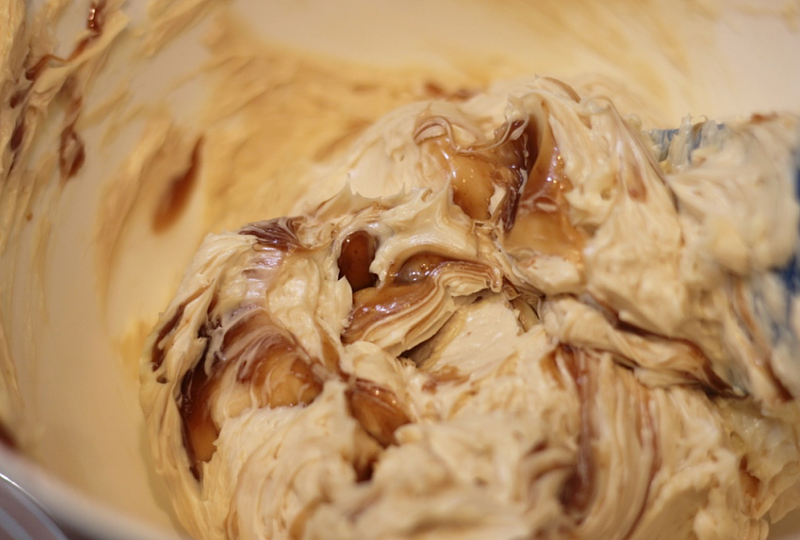 Keep mixing until the butter and cream cheese are uniform, but do not overmix. You don’t want to cream this mixture—it would add too much air to these cookies, which would only make them drier and more likely to spread. It should stay “wet” looking and un-fluffy, like this. It kinda looks like hummus to me. I used these adorable Thumbprint Cookie Cutter Stamps from Williams Sonoma that are ideal for creating sharp edges along with a perfect little well in the center for the lemon curd (lazy? Just use pre-made jam instead!). Or you could just make thumbprint cookies the old fashioned way—with an actual thumbprint—either way, these cookies are going to taste fantastic. Adding a touch of heavy cream to citrus curd makes it a bit more opaque, giving the color more saturation—plus it adds a touch of extra creaminess. I like tasty salted butter in my curd, but feel free to use unsalted if you prefer. Try to make sure you’re not letting any egg whites get into your mixture as you separate your eggs, since it is usually these errant whites that end up cooking and ruining your smooth curd with icky lumps. This recipe will make more curd than you need for the cookies, but not more than you need, you know, in your life in general. Bring about a cup of water to a simmer in a small saucepan. Whisk yolks and sugar in a metal or glass heatproof bowl and place over simmering water. Whisk for about a minute, until the yolks lighten, then add zest and juice. Whisk for 8 minutes, or until the mixture is thickened. Stir in butter, one piece at a time, until fully incorporated. Strain mixture into a small bowl and allow to cool to room temperature, then cover and place in fridge to chill. 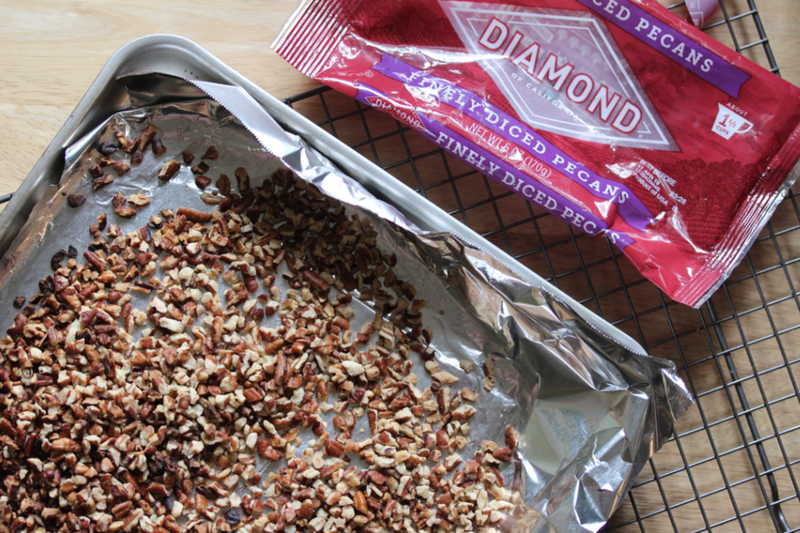 Cut a long piece of wax paper, a bit longer than your cookie sheet. Place the rested dough on the wax paper and allow a margin of the paper to fall over the side of the table or counter you are rolling on. 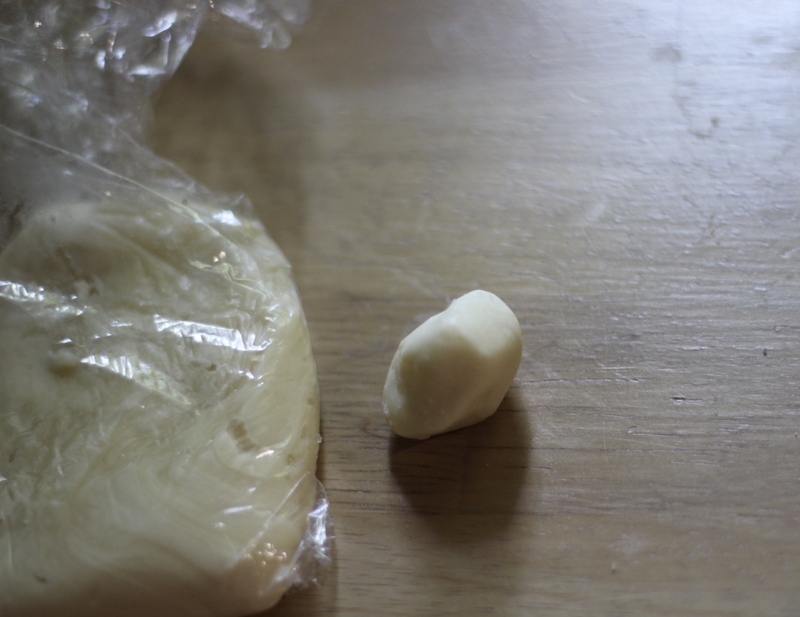 Then cover the dough with another sheet of wax paper and start to roll the dough, unsticking and repositioning the top sheet of wax paper as needed (I do this after each roll). Hold the bottom sheet of wax paper in place by pressing your legs or tummy against the lip of the wax paper and the edge of the table or counter. It’s a bit odd, but this is the best way to keep the wax paper from sliding around as you roll out the dough. 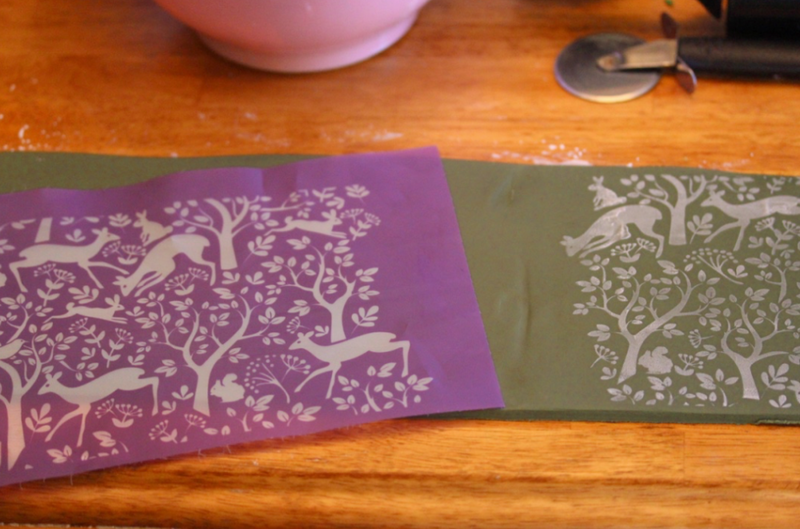 Keeping the dough sheet on the wax paper also makes it super easy to pick up and transfer onto your baking sheet to freeze before cutting out shapes. I also use perfection strips to keep my dough a consistent thickness. They work much better for me than the spacer rings you can buy for rolling pins, since I’m a klutz and I can never seem to keep the rings from rolling over my dough and messing up the thickness. Once the dough is fully rolled out, cover the dough sheet with plastic wrap and place in the freezer to chill until firm. All cookies I bake I cut straight from the frozen sheets of dough then pop immediately into the oven. You’ll get less spread and sharper edges by cutting and baking from frozen dough. Just be sure to peel off the wax paper as well as the plastic wrap and the cookies will come off your cutters easily and won’t lose their shape as you transfer them to your cookie sheet. Now, you’ve got to be careful on timing here. The cream cheese and the fruit powder both work to mask the usual visual cues that tell you when a cookies is done—dry top, brown edges. The cookies will puff slightly as they bake, then start to settle. It is once they start to settle that you want to pull them. You’ll notice slight browning on the bottom edge of the cookie, but other than that, the cookies will not change color much—which is great for these fruity beauties. Whisk together the flour and baking powder in a small bowl and set aside. Using a hand mixer, mix butter and cream cheese on low until fully combined and no lumps of cream cheese remain. Add sugar, salt, extracts, and citric acid and mix until just incorporated. Add the yolks and mix again until just incorporated, then repeat with the fruit powder. Remove dough ball from bowl and knead a few times in your hands to make sure the flour is fully incorporated. Divide into two balls and flatten into discs. Wrap well in plastic wrap and allow to chill in the fridge for about 20 minutes—until it is rested and firm but not rock hard. 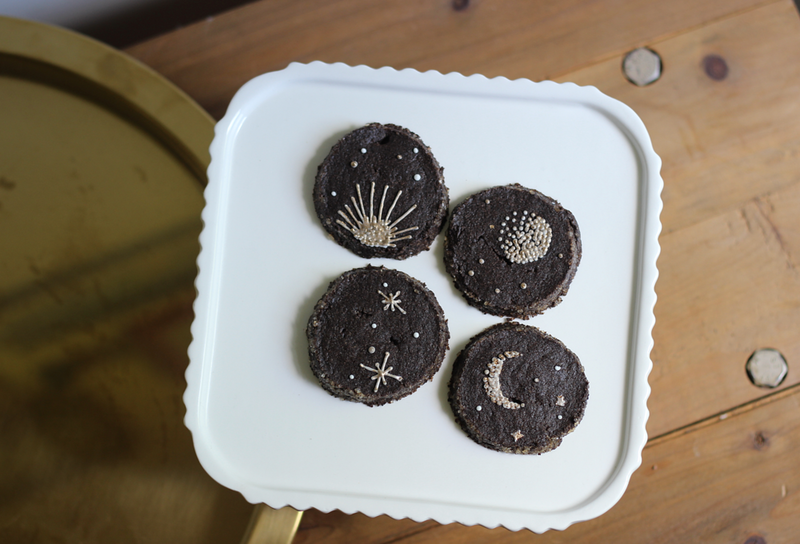 Roll out each disc between sheets of wax paper then freeze dough sheets if using a regular cookie cutter, or cut shapes immediately if using the cookie cutter/stamps with plungers. Freeze cookies for at least 15 minutes before baking. When you're ready to bake, preheat your oven to 350 degrees F. Line cookie sheets with parchment or silicone baking mats. Remove dough from freezer, cut shapes directly from frozen dough sheets, and bake frozen shapes immediately on cold or room temperature cookie sheets lined with parchment paper. If shapes become soft as you work with them, be sure to refreeze before baking. Bake for 8-12 minutes. Cookies will not brown much due to the cream cheese, so just look at their bottom edges for slight browning where the cookies touch the cookie sheet/parchment/silpat. Allow to cool completely, then frost and fill with chilled lemon curd. After a season of cakes, I am ready for something with a little more texture to it, something crunchy and rich. These cookies have an unbelievably addictiveness to them and I think it's down to the texture: crumbly, tender shortbread with bursts of crispy poppyseeds and crunchy sanding sugar on the edges, not to mention the incredible flavor from Banner Butter. The graham flour, which I'll explain more about below, provides a lovely, homey flavor and also adds another dimension of texture for a truly multi-textural experience. They are salty and rich with dark chocolate flavor, perfect for paring with coffee or, as I did here, a bit of white chocolate. They are also exceptionally easy to make and have only one (ONE) annoying step (grating frozen butter), which I think is impressive for how delicious they turn out. Let's start with the modeling chocolate. Now, modeling chocolate, if you don't know, is a miracle. It's as pliable as fondant, perfect for using with silicone molds, sculpting, rolling out and cutting, or just messing around with, but unlike fondant it is DELICIOUS. Unlike fondant, which is evil to put on cookies, it is delicious. 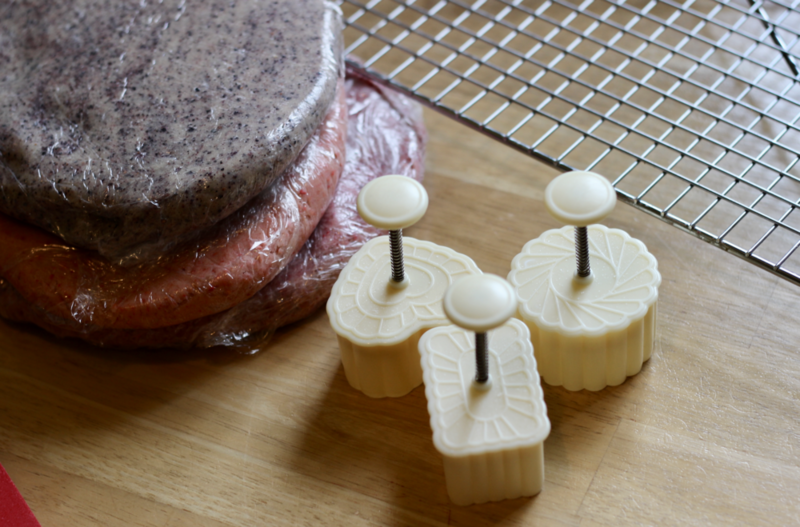 Even if you don't have any cool food-grade silicone molds sitting around to press the modeling chocolate into beautiful decorations, you can still roll it out and make some beautiful designs with a knife or small cookie cutter if you want. You can even brush it with edible luster dust for a fancy finish. Stored in a sealed container, it should last a long time, reviving with a bit of warmth from your hands, and can be used for all kinds of fun baking projects down the line, so I recommend having some on hand. I'm not even going to give you a recipe for it since there is no way to top Cake Paper Party's chart and instructions. My only change is that I highly recommend using Guittard's Choc-Au-Lait chips for your white chocolate version and nothing else. They are, as I mentioned a few posts back, the only edible white chocolate chips on the market in my opinion. I found them recently at Whole Foods, so you might try that if you're not willing to wait for an online order. So basically you just melt the white chocolate chips, then mix in the correct amount of corn syrup for the consistency you want. Be quick and gentle when folding in the corn syrup. As soon as the mixture has the consistency of peanut butter, STOP. There may still be streaks of corn syrup--it's ok. Let it all cool for at least two hours. Knead once cool, and the mixture should incorporate to a smooth, play-dough like consistency. See the first photo here? That's as far as you should go when microwaving white chocolate to melt it. Stop while you still have large chunks, then just stir until the chunks melt. Heating your white chocolate chips in the microwave beyond this point only leads to despair. Trust me. In general, be careful of overworking modeling chocolate. If it gets too warm from your hands, it can break into an oily mess. There is a way to fix this though, so don't toss it. I really think these cookies are even better with a smidge of the creamy white chocolate on top, so even if you didn't want to mess with all this I would still throw in some rough-chopped chunks of white chocolate into this shortbread, or drizzle some melted on top for a very easy fix. Now onto the cookies themselves. We've covered shortbread already, and this one has some changes from that recipe (which I still think is the best all-around vanilla shortbread out there) due to the cocoa powder and this cultured butter I want to use. I am IN LOVE with Atlanta's own Banner Butter, and I knew it would shine in this shortbread. If you can't find Banner, be sure to use some other kind of cultured butter as a substitute, like Plugra, Lurpak, or a local butter if you can find it. The slight tang to this butter gives the cookies a subtle buttermilky flavor, and the rich fat content is important to the recipe proportions. You can keep a log or two of this dough in the freezer forever, and whip it out any time you need a quick cookie for your guests. Or yourself. Just whip out your log and slice. Ok sorry, I had to. I'll stop saying "log" now. Graham flour is the same thing as whole wheat pastry flour, but it is not exactly the same thing as whole wheat flour. Named for who else but the 19th C Presbyterian minister who railed against bread made with white flour (he called it "tortured") and masturbation (he called it "Self-Pollution"), graham flour is milled from the same soft wheat that cake flour is made from and it is unsifted, unlike whole wheat flour. The grain's outer hull is ground more coarsely, and yet the inner kernel is finer than whole wheat flour, so what you end up with is a light, not dense, crumb while still benefitting from the texture of the whole grain particles. It also has that nutty taste that will remind you of a graham cracker, which makes a nice base for the chocolate and acidic butter here to play against. Place butter in freezer for at least two hours, preferably overnight. Once butter is rock-hard, grate quickly using a box grater into a large bowl, re-freezing the butter if it starts to soften. Chop up the last few chunks rather than grating down to your thumbs. Sprinkle salt and poppyseeds over grated butter then return to freezer for at least 20 minutes. Meanwhile, whisk powdered sugar, flour, and cocoa powder together in a small bowl. Once butter is chilled, add flour mixture and quickly toss with your hands (use disposable gloves for this part if you have them). Then, add the egg yolks and vanilla and quickly mash and squeeze dough until it comes together. It may be streaky with chunks of butter. Squeeze just until it holds together, then separate into two balls and place onto plastic wrap. Work the balls into logs and roll tightly using the wrap. If dough becomes soft and warm, allow to chill before proceeding. Unwrap, the re-roll the logs in coarse Demerara sugar, then wrap tightly. Place the two logs into the freezer to chill overnight or until completely solid, at least four hours. Heat oven to 375 degrees F, slice dough into ¼ inch discs, and bake for about 12 minutes on a parchment-lined tray. Cool completely before storing. It's been a while since I have reminded you of how much I love tea, I realize. Assam tea in particular has such a rich, malty taste that I knew it would be delicious in a cake, especially paired with a bright, floral-ish citrus like blood orange. The flavor combination is delicate and interesting, one of my new favorites. 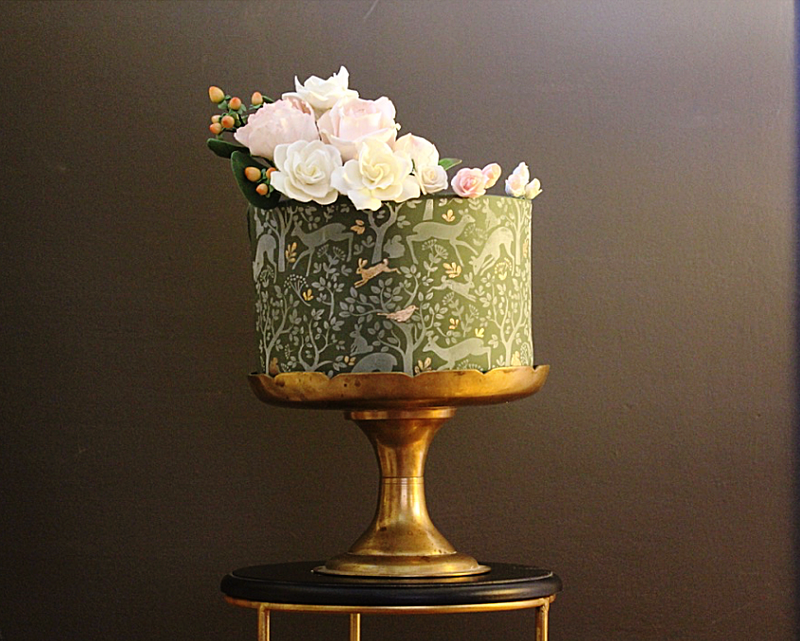 The design for this cake was inspired by one of my favorite local Atlanta artist, Charlotte Smith. I fell in love with her work when I purchased one of her tea cups (pictured above) from Young Blood Boutique and filled it with tea and held it in my hands. Her cups are transcendent vessels for tea lovers, just the perfect size and comfortable shape for cradling. I love her elegant minimal aesthetic, rendered here in these tiers with admiration. Italian meringue buttercream is probably, as we've been over before, the most annoying of all the buttercreams to make because it requires extra steps, precise temperature monitoring, and a long wait for cooling. But man, it is really worth it once in a while. If you've never made one before, set aside an hour or so and treat yourself to this incomparably silky treat. Now, one of the important things in making IMB is allowing the meringue to cool to 80 degrees F before adding the butter. BUT! If you are impatient and mess it up, as I have done many times, you will end up with a horrific cottage-cheese like mess that seems irredeemable, but it's not. Just keep letting it cool and whip, and it will come together into its true silky smooth form. I used fresh blood orange juice in place of the water used for the sugar syrup here, giving the buttercream a mellow citrus flavor and a light pink color. You could definitely use any other citrus here if you preferred, just be sure to strain the juice well to remove the solids. Blood oranges are less acidic and more floral than regular oranges and yes, add more sweetness to the buttercream but I didn't adjust the sugar since I find that often IMB can use a bit more sweetness. I don't recommend trying to make this buttercream without a stand mixer. You may actually die from trying to hold a hand mixer for a freaking hour. Plus trying to pour in the syrup with the other hand...just, no. Read the instructions a few times in advance and be prepared to act fast when your sugar syrup reaches soft ball stage (240 degrees)--higher temps will result in stiff syrup that doesn't incorporate properly. I love my ChefAlarm thermometer from Thermoworks. You can set an alarm to beep at a certain temp so you don't have to stand there watching it. Place egg whites in a stand mixer bowl with cream of tartar. Whip with whisk attachment on medium speed, no higher, to soft peaks. Add 2 oz of sugar and salt gradually, beat to stiff peaks then turn off mixer. Heat juice and 6 oz of sugar over low heat until sugar is dissolved, stirring constantly, then raise the heat to medium and clip in thermometer. Bring to a low boil until temperature reaches 240 degrees F. As soon as thermometer hits 240, remove from heat, turn mixer on low, and slowly pour a syrup in a thin stream between the mixer bowl and the whisk; do not scrape bowl or whisk if unincorporated syrup remains. Beat on medium until meringue is fully incorporated. Place mixer bowl in the freezer or fridge to cool for about 15 minutes, or until mixture lowers to 90 degrees. Return mixer bowl to stand and mix on low until temperature reaches 80 degrees F. Add soft butter, one piece at a time, waiting until each cube is fully incorporated before adding more. This process can take up to 25 minutes. Once all the butter is added, beat until mixture is smooth and fluffy. Add vanilla extract or other extracts as desired. 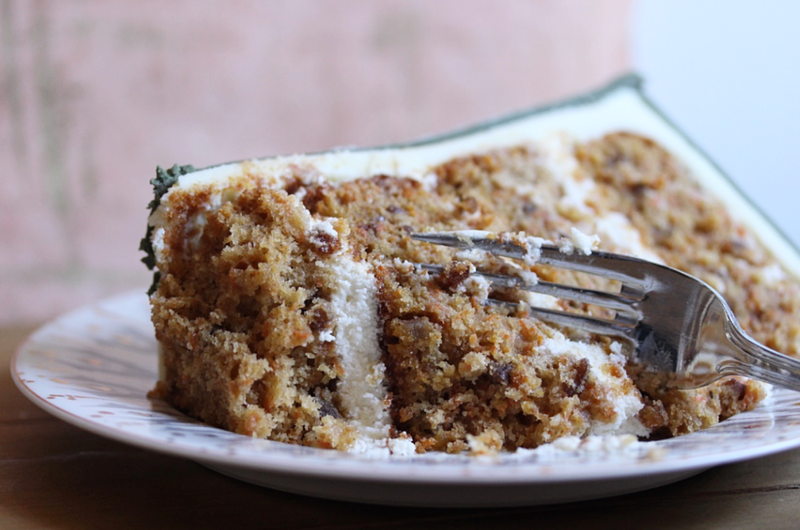 I had been making a Chai cake recently using a homemade Chai extract, and that was pretty good, but the flavor didn't have quite enough depth. Following the time-tested rule of putting flavor as close to fat as possible for maximum power, I decided to steep the tea in my heavy cream and boy oh boy did that work. 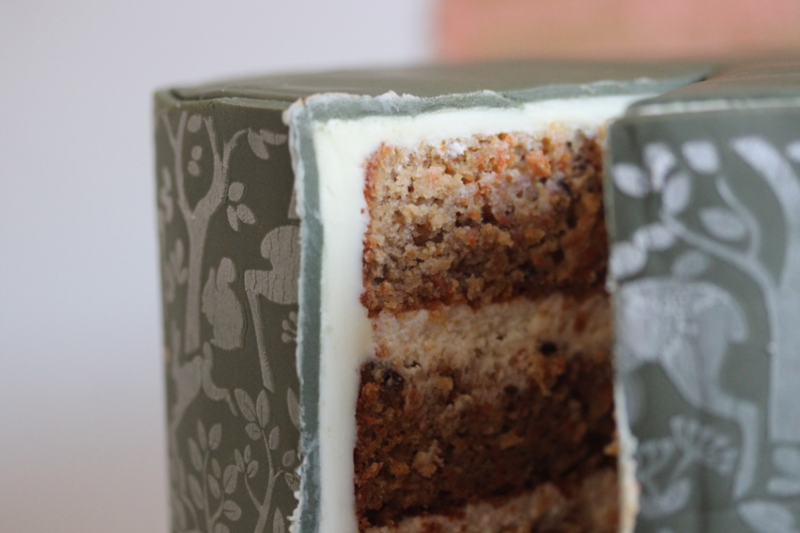 The cream carries incredible flavor to the finished cake and the tea payoff is incredible. I thinned the cream a bit with water just to make it looser and easier for the tea to absorb. 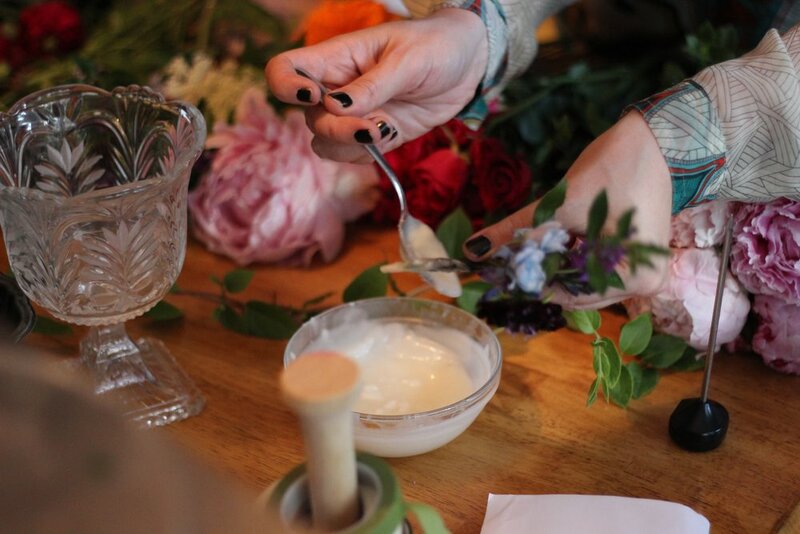 I doubled this recipe so was using a full half cup of tea in this cream, which seemed like a hilariously large amount of tea to use for anything, and with the intensity of the results, I almost felt like it was too much! But the day after baking, the cake had mellowed a bit in flavor and it seemed exactly right. Spring is now melting away into summer, aka berry season. But it might not be until late summer when I'll be posting again, undoubtedly with some transformation of the season's treasures into some little art project, as I'll be in Europe soon to do some writing for a few months. Find me on Instagram to track my progress on my next adventure! Whisk flours and baking powder together thoroughly in a large bowl and set aside. Bring cream and water to a simmer over low heat in a small saucepan. Add the tea leaves and turn off the heat, allowing the tea to steep for about 15-20 minutes, stirring occasionally. Drain leaves from cream and allow the cream to cool in the fridge for another 15-20 minutes. Beat egg whites, sugar, salt and vinegar for one minute (use a timer) on medium high until mixture is thick. Add sour cream to heavy cream and beat until smooth. Add cream mixture gradually to sugar mixture, then vanilla, and beat until smooth for 30 seconds. Add oil to the flour mixture and beat until a dough forms. Add 1/3 of the cream mixture and beat until smooth and lump-free. Repeat with the remaining 2/3rds, scraping the bottom of the bowl and making sure no lumps remain. Divide batter among three greased and floured 8" or 9" pans and tap on the counter to remove large air bubbles. Bake for 15-25 minutes until centers are fully set and spring back when pressed. Allow to cool for 15 minutes in the pan, then level, fill, and frost. This cake hurts my feelings. I am upset that I have created this cake. This cake just shut the whole game down. Switch off the internet. Unplug the blog. It's all over now. You know me by now, which means you know there is going to be some slightly (or not slightly) annoying/time consuming procedure that makes this chocolate frosting and this banana cake the best thing in the world and you're not wrong, genius reader. You're not wrong. But, my darling reader, you will be richly rewarded for your labor. Yes it takes an entire day to make this frosting, but look at how much hot fudge this recipe makes. LOOK. You won't need all of it for the buttercream, so you can just jar the rest and keep it in the fridge, or give it to your friends if you hate personally enjoying hot fudge. You have not had this hot fudge buttercream before, because I made it up. You have never had chocolate buttercream like this before. It tastes distinctly different from chocolate buttercream made with just cocoa powder or melted chocolate or both--it has a slight caramelized flavor to it from the hot chocolate (which cooks for upwards of 45 minutes). Its texture is richer than rich, smooth as silk and downright fatty. It's got this body to it, the kind of body you dream about: thick. So first we're going to make this vat of hot fudge. Then you're going to let it cool completely (preferably overnight) and then we'll add it to some whipped butter to make the buttercream. Now, look at my hot fudge recipe. Guess who is the star of the show? AGAIN?? That's right brilliant reader, my favorite baby, heavy cream. Heavy cream. As with caramel, any recipe for hot fudge that relies on evaporated milk is thumbs down into the center of the earth. It is just pure, rich cream that gives our hot fudge the fatty body it needs, no artificial thickeners or overly sweet cans of goo required. 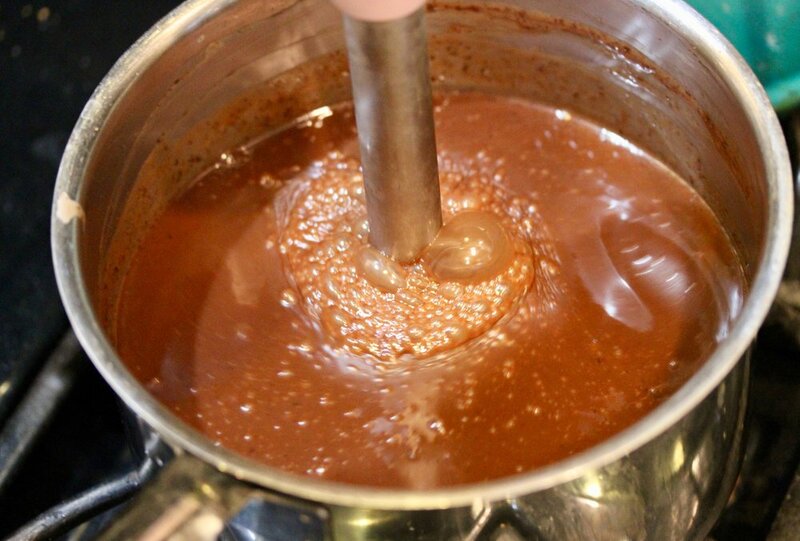 Towards the end of the cooking process, the chocolate actually starts to separate, with visible chunks and an oily sheen in the mixture, and you will think it's all gone wrong. But this separation is exactly what we're going for, so don't worry. Once you whip in the butter the emulsion all comes together and you get that perfectly smooth, fatty mouthfeel only old-fashioned hot fudge sauce can provide. If you have an immersion blender, bust it out, as it is the ideal instrument for achieving the silkiest texture here. It will go from upsetting liquids chocolate soup to a thicker glop then to oily mess then to PERFECTION. This buttercream is not too sweet, so if you want it sweeter, feel free to add powdered sugar to your butter as you whip it up. Just a small amount, like a quarter cup, will add sweetness without adding grit. Stir together the cream, sugar, and corn syrup in a large heavy-bottomed saucepan over medium heat until the sugar is dissolved. Raise heat to medium high and bring to boil. Add the chopped chocolate and salt, stir. Reduce heat to low and simmer--you should have burbling in the center of the pot but not on the edges. Stir occasionally and let simmer for 45 to 50 minutes, until you see an oily sheen in the mixture and small solids separating out. Turn off the heat and add the butter and vanilla, whisking vigorously or using your immersion blender. Let cool uncovered on the counter for at least thirty minutes, then cover with plastic wrap and transfer to the fridge to cool completely. Allow fudge to cool for at least four hours or overnight. Obviously, heat up your hot fudge sauce in the microwave (just a few seconds will do, be sure to stir well) before serving over ice cream or cake or just eating straight off the spoon. TO make the buttercream, simply whip up your room temperature butter until light and fluffy, then add about half (two cups) of the cold hot fudge sauce. Add powdered sugar to taste if you like it sweeter. Huh, I realize I took few photos of my banana cake, the actual...cake in this situation. Well, you can see where my priorities lie with this post and it is squarely with the hot fudge sauce. But I guess you do need some kind of cake to help chauffeur this buttercream to your mouth (or DO YOU??) so here's the banana cake part. You'll need three very ripe bananas, not just spotty but very, upsettingly ripe. They should seem downright rotten. Allllll of the starch in these naners should be converted to sugar and their flavor should be super intense at this point. 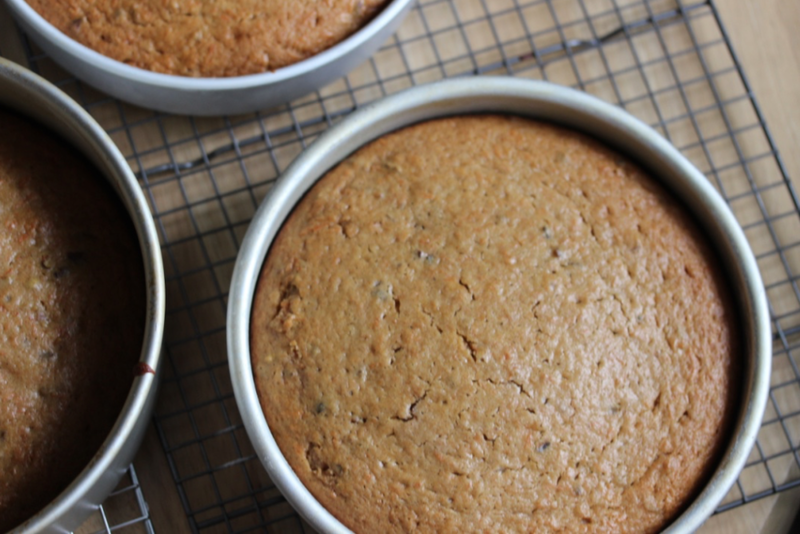 If you use only slightly overripe bananas you will end up with a drier, starchier cake with less flavor. A little bit of brown sugar is a nice pairing with banana flavor, as is the tenderness that acidic heavy cream and vinegar brings. You could definitely use buttermilk here if you wanted to, but actually I was looking to avoid that unique buttermilk flavor in this cake to allow the banana to shine, but feel free to make the swap. This cake is quite sweet in my opinion, so it goes well with a rich, not-too-sweet frosting like this chocolate one, but a slightly tangy one is great too, like this cream cheese frosting. I'm all for layering natural flavors with their extract versions, so if you have some banana extract there is nothing wrong with adding a small amount here to really deepen the banana flavor, but this cake is sufficiently banana-y enough without it. In a small bowl, whisk together the flour with the baking powder and baking soda and set aside. Add sugars, salt, and extracts to bananas in a large bowl and whip with a hand mixer until well incorporated and bananas are smooth. Add eggs and beat for two minutes until lightened. Add cream and vinegar and beat for one minute (this can be substituted for buttermilk if you prefer). Add oil and beat until incorporated. Finally, mix in 1/3 of the flour mixture on low until incorporated, then the rest of the flour; mix on low until batter is smooth. Divide among three 8" or 9" pans, or spread into one 9x13" pan, and bake until center is just set, about 25-35 minutes. Cool completely, then frost. It's a very light, tender and super moist cake, although very delicate and not easy to carve. I think the perfect thing to do with this guy is just throw it all in a 9x13 pan and frost when cool (some people call this "snack cake" but all cake is snack cake to me). 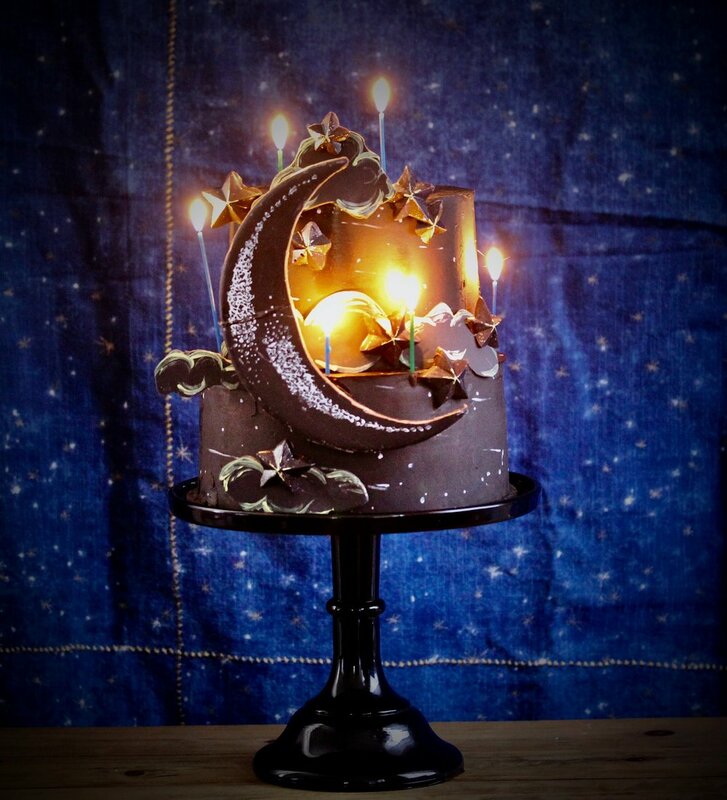 It being January and our lives full of nighttime lately, I felt inspired to make a layer cake inspired by the night sky. I made a black dark chocolate ganache and some chocolate stars along with a big chocolate moon (which fell off the cake mid-shoot (you can see the crack in it where I repaired it in the candle photo). The night sky is wild and can't be held down, it reminded me. For an extra sparkly nighttime, warm up your reserved hot fudge and serve it with the cake. Good thing its gratitude season, because I've been feeling positively awash in things to be thankful for lately (not the least of which is winning an NEA fellowship for prose (!!?!?!!)). I've also been thinking a lot about how lucky I am to do meaningful work as a teacher. I know not everyone looks forward to getting to work every morning like I do. On top of that, I get to live in Atlanta. I don't know what it is exactly, maybe just that romantic slant of light in the fall, maybe the sentimentalism of the first touch of those seasonal mean reds, but I've been deeply extra in love with my city lately. So I thought my Thanksgiving treats this year ought to pay homage to The A, my vibrant, beautifully diverse and thriving adopted hometown--and nothing could be more perfect than to represent Atlanta's signature lemon pepper wings with a lemon pepper cookie. 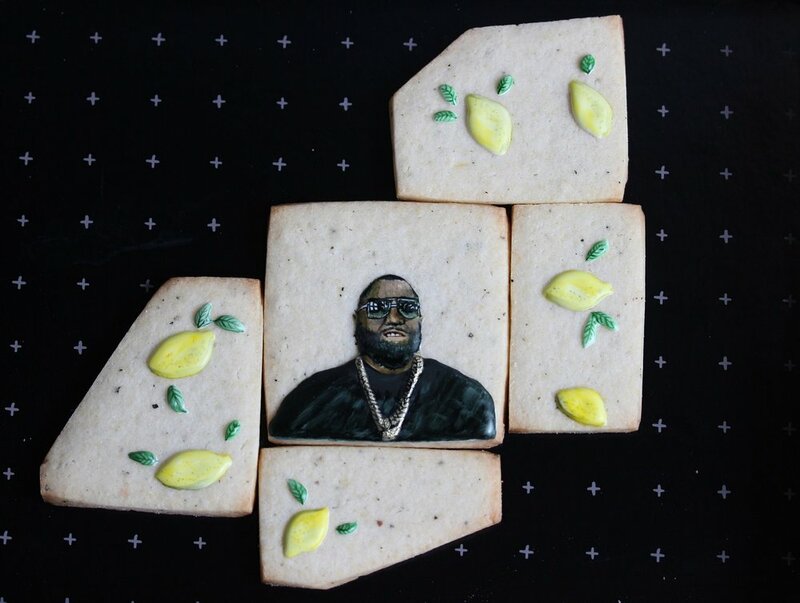 Oh, and to put Killer Mike, true Atlanta native, on that lemon pepper cookie. Boosh. This cookie is made extra rich and buttery with cultured butter. You can get some great European cultured butters out there but one of the best stateside is Vermont Creamery's cultured butter, which is pretty easy to find at the grocery store. I love the slightly buttermilky tang and incredible richness of this butter. To adjust for the extra fat in this type of butter, a touch of cornstarch is added to the cookies, which also makes the crumb a bit finer and the texture silkier. I really love a cut-out cookie that is not too hard, not too soft, and keeps its sharp edges--this recipe hits all of those notes expertly. Citric acid is key for a bit of bite to your lemon bakes, so it is definitely worth seeking out (you can often find it in the canning/preserving section at the grocery store). You'll never be able to achieve that true citrusy tang with lemon rind alone (discussed previously in this lemony treat and that lemony treat). Pepper balances out the bright lemon with an earthy bite and elevates this cookie to glory. If you're not up for royal icing decorations, might I suggest smearing some strawberry ice cream between two of these babies and freezing up some incomparably tasty ice cream sandwiches, or drizzling with white chocolate. The cream cheese in this dough helps make that perfectly soft but rich texture and prevents the cookies from spreading too much. Unlike when you are creaming butter and sugar for cakes or other applications, you don't want to whip too much air into cookies meant for cut-out shapes. About half the time (4 minutes instead of 8 minutes for a full creaming) is sufficient, as any more can lead to distortion in your cookies as they bake up. A full description of my rolling-out method can be found here. Honestly, one of my favorite ways of dealing with cut out cookies is to just slice up a sheet of frozen dough with a pizza wheel--less stress and no scraps. This recipe makes, I don't know, a buttload of cookies, so feel free to halve it if you would prefer. But really, this is such fantastic cookie dough to freeze and have on hand for when you need a little something special so I recommend making the full amount. Do like I do and cut out a bunch of basic squares or rounds and store them in a Tupperware container in the freezer so they are ready to bake whenever the mood strikes. Use a paper towel soaked with a little white vinegar to wipe out your bowl and beaters. Place warm water in the bowl, then sift egg whites over the water. Allow to sit for five minutes, then mix on low with a hand mixer until powder is evenly distributed and no large lumps remain. Then increase the speed to medium and beat to foamy soft peaks, add extracts and corn syrup, then slowly add powdered sugar 1/4 cup at a time. Beat until stiff and smooth. Use a tiny amount of water to thin icing to desired consistency. Cover bowl with wet dishtowel and allow to sit for ten minutes or more to allow bubbles to dissipate. Store covered or in piping bags. Whisk together the flour, cornstarch and baking powder thoroughly in a bowl and set aside. Cream the butter, sugar, cream cheese, lemon zest, pepper, citric acid, and salt in a stand mixer with paddle attachment or in a large bowl with your hand mixer for about 4-5 minutes. Be sure no lumps of cream cheese remain. Add the yolks and vanilla and mix for another minute. Add the flour mixture in two batches and mix until just barely incorporated. Remove dough ball from bowl and knead a few times in your hands to make sure the flour is fully incorporated. Divide into three discs, wrap in plastic wrap, and chill/rest dough in the fridge for about 20 minutes. 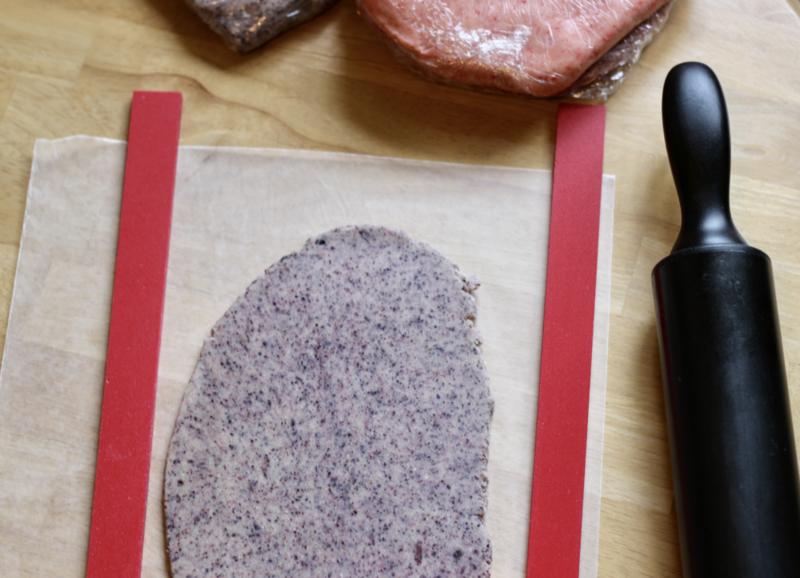 Roll each disc onto a between two sheets of wax paper into a 1/4" rectangle that will fit your cookie sheets. Cover each dough sheet with plastic wrap and place on cookie sheet, then place cookie sheet into freezer. Chill for at least an hour, but can be left in the freezer for up to 3 months in sheets. When you're ready to bake, preheat your oven to 350 degrees F. Remove sheets from freezer, cut shapes directly from frozen dough sheets, and bake frozen shapes immediately on cold or room temperature cookie sheets lined with parchment paper. If shapes become soft as you work with them, be sure to refreeze before baking. Bake for 8-12 minutes. They will puff slightly but then shrink back down to their proper shapes. Cookies will not brown much due to the cream cheese, so barely golden bottoms and set centers are the best indicator of doneness. Allow to cool completely, then frost if desired and gobble.